The experience of the first socialist countries (the Soviet Union, the Chinese People’s Republic, and the others) taught many things about the political order the socialist countries need in order to carry out their historical role: the transition of mankind to communism. Leaving aside the labor force, essentially the first socialist countries abolished the private property of the productive forced and of the conditions of production (land, mines, regulation, money, research, education, etc.). Productive forces were ruled by public authorities. So, in every socialist country the public administration, the State and in general the political structure had a role more important then they ever had in human history. The orientation of political organizations and their composition had become the decisive factor for every transformation, and therefore, in general, for the transition from capitalism (and from the other more backward productive systems and social relations persisting in the first socialist countries) to communism. The political organisms directed all productive units and all country’s institutions (schools, universities, media, research institutes, etc.). More or less effectively (as reality not always followed the established rules and laws) they directed the entire system of social relations. Politics had become the decisive factor of social life. One of the great discoveries of Maoism, one of the five main contributions that Maoism gave to communist thought,(1) is that in socialist countries the bourgeoisie is mainly constituted by those leaders (of Communist Parties, of State, of mass organizations, of firms and institutions) who follow the capitalist road. What does “leaders who follow the capitalist road in a socialist country” mean? It means that they are leaders who give or try to give bourgeois solutions to the problems the socialist society has to solve. They are leaders proposing and supporting bourgeois solutions for socialist society’s problems. Till now mankind has done his history mainly blindly, from behind. Men have understood what they built only afterwards. On the contrary, every socialist society has to give practical solutions to many problems but, by its nature, it has to give them consciously: the conscious action largely takes the place of the spontaneous one. Every socialist society faces problems that get different forms, aspects and contents in the march of time, owing to country’s internal development and to the development of its international relations, and to the development that occurs in the rest of the world. New problems arise during its history. It has to give answers to everyone of them. The answer it gives contributes to determine the way the society follows and what it really becomes. Let’s make some examples, mentioning some of most important problems. How can we make sure that every adult person carry out the work assigned to him with care and creativity? Who establishes which work some adult person has to carry out concretely, during his life, one phase after the other? How can we lead on a large scale men and women, all human beings, to carry out the role of responsible members of the society, of creative promoters of society’s life, of creators of the new society? This is the central question that mankind has to solve in the socialist era. Every socialist country has to solve it. Every socialist country, once it has essentially abolished the private property of the productive forces different from labor force, has to solve this task. Still in the last year (2008), undertaking the presidency of Cuba, Raul Castro indicated this (making sure that every adult person carries out the work assigned to him with care, creativity and loyalty) as the main problem of Cuba, and stated that, in order to solve it, it was necessary to return to bourgeois methods. It is what before him has been done by Kruscev, Teng Hsiao-ping and all the other revisionist leaders that begun the decadence of socialism in their respective countries. The latest secretary of the Unified Workers Polish Party (so it was called the communist party in Poland), M. Rakowski, openly declared: every Polish worker has to give up thinking that job, house, heating, clothing, feeding, education, health care and other more thing are due to everybody as the air he breaths; he has to learn that they are things that everybody must achieve by hard work. It is a task substantially new in comparison with those that capitalists have faced in bourgeois society. In order to solve it, in everyone of the first socialist countries, in the phase in which they were advancing in the transition from capitalism to communism, different and changeable arrangements of means and organisms were set running. In every socialist country many solutions were tried. In differing ways, coercion and formation were arranged and, in formation, for every individual and group, it was arranged training by a teacher and learning by one’s own direct experience and its balance. Moral incentives and material, economical incentives were arranged in differing ways. In every socialist country this was (and so it had to be by its nature), a process directed by the vanguard promoting the ongoing transformation: the communist party. At the same time it is a task whose most and definitive objective is the emancipation of the masses from the need to be directed by a vanguard as the communist party. That is to say, by a group organized, different from the rest of the population, constituting itself not by decision of the masses but of its own members, that reproduces itself even without the conscious intervention of the masses, that has an its own life that cannot be known, controlled and still less decided by the masses. The result to which socialist society has to tend by its nature is that population constitutes a society that produces its leading organs, correctly knows what they are doing, exercises ongoing and permanent control over them and in every time decides how they are composed, which is their orientation and their destiny. So, it is an very organized society, but without State (intended in it own sense, as organism distinct from the rest of the society and done by people professional in coercion). Exercising in society its own role, the communist party, according to the line it follows, leads society towards communism or towards capitalism. Or it develops, strengthens and multiplies the germs of communism and leads the masses to create a society more and more advanced, and materially, spiritually, intellectually and morally richer. Or it stifles the germ of communism, defends and strengthens what survives of the bourgeois relations or even more backward ones (and these are the more strong and numerous the less capitalism was developed in that country) and makes live again those that were already wiped out. Who decides the direction the party really follows? The two lines struggle, another one of the five main contributions that Maoism gave to the communist thought. (1) Essentially, there is no other way for deciding it. Let’s think about the matter in a larger context. Socialism introduces human kind in a new phase of its history. With communism, every member of the society will not only enjoy the material patrimony of the society, but he will also join with equal dignity the planning, the valuation, the direction and the management of social life that largely includes also the life of every single person. He will have the intellectual and moral means needed for doing it. He will share the cultural patrimony of the society till now reserved to the ruling classes. The founders of Marxism, basing themselves on the balance of mankind’s history and of the laws of development of bourgeois society, indicated that mankind was going to such a phase in its historical evolution. They indicated that it had to carry out the passage to such a phase in order to continue its course of progress in its multimillennial evolution. Mankind never experienced something like this, unless perhaps in its more primitive, nearly animal phase of its existence, when however social life was nearly nothing. In order to understand this better, let’s think human beings and their capacity of writing and reading. A little more than hundred years ago, only a little minority of human beings was able to read and to write. The pope Leone XIII (1878-1903), distinguished exponent of European reactionary classes and forces, declared that who asserted that every human being could learn to read and to write was guilty of blasphemy, that is of offence to divine law. Today nearly all the human beings of the imperialist countries and of many other countries are able to read and to write and nobody denies anymore that human beings can do that. On the contrary, it is universally accepted that every human being has the right to education, even if this does not mean that everybody will become a great writer. Something like this happens as regards the role of individual in planning, valuation, direction and management of social life, as regard sharing cultural and moral patrimony of mankind. Individuals’ participation in planning, valuation, direction and management of social life by its nature implies the conscious and autonomous participation of individuals in a very organized collective process. In socialism human beings learn this participation on a large scale and everybody gets the intellectual and moral means needed for it. The bourgeoisie solves the problem to make the individual carry out with care the work assigned to him in a primitive and simplistic way. Rich people are free from work; every rich man works only if he wants and according to his liking. Proletarians are employed for carrying out a work or dismissed by capitalists and other rulers of society: these ones act according to their opinion according to their interests. With this primitive system the bourgeoisie involved mankind in the social process of production, proletarianizing it. But if this system will last for a long time, it will lead a great part of the 6,5 billions of human beings to extinction. As a matter of fact, for the capitalism that has come to it final phase, the great part of human beings are in excess. The undeclared extermination war the bourgeoisie carries out more and more savagely and intensely these last thirty years against popular masses everywhere in the world, shows it clearly. The final phase of the second general crisis of capitalism, which we enter in the last year, makes see this conclusion of communists also by experience and by sight. As in the ambit of bourgeois society human beings learned to read and to write on a large scale and every individual received a moral and intellectual patrimony greater than that received by a member of former social formations, in the ambit of socialism they will learn on a large scale to participate in planning, valuation, direction and management of social life. Communism will begun when this learning process will get an high level; the quantity of human beings that will have learned will change in a new quality of human society: the communism. Socialism is a highly contradictory phase of human history. Some organized individuals direct others to organize themselves and so to need no more to be directed. Therefore the political structure of society becomes the central issue of the socialist phase of human history. It still exists (as in former societies) an organism of professional people for social coercion (the State), and at the same time the human beings must learn to do without it, to organize and collectively direct themselves everyone acting with freedom, autonomy and responsibility in the ambit of the institutions and relations that society consciously gives to itself. How can we deal with this contradiction? Also in this field, men will learn the way they have to follow by their experience. For now we have the experience of the first socialist countries and we have to bear it in mind. We have to analyze it from the point of view of the political systems that have been carried out in the first socialist countries and learn for going onwards. Imperialist bourgeoisie, clergy and the other reactionary classes denounced and denigrated on a large scale the political regimes of the socialist countries. Just they, who are the oppressors, the last leftovers of the classes that exploited and repressed the rest of mankind, the promoters of world wars, of systematic massacres, of genocides; just they who marginalize the great part of mankind in misery, ignorance and intellectual and moral brutishness; just they who are the promoters of the undeclared extermination war afflicting mankind everywhere, have grasped the flag of democracy and freedom against the coercion that was carried out in the first socialist countries. Today the renewal of the communist movement is going on everywhere. In this ambit are largely discussed the balance of the political system of the first socialist countries and the lessons the communist must draw from it. The more they are discussed, the better it is, as the problem is important, as we need to learn things that we still do not know, as the reactionary classes exercise a negative influence with their denigration of the experience of the first socialist countries. In this discussion, the comrades who try to analyze the experience of the first socialist countries with the categories elaborated in the analysis of bourgeois or even more primitive societies are wrong. It is not possible to understand a higher being with the categories of a lower one. This is a general rule found in every field of scientific research and is valid also in social sciences. Socialism faces tasks that capitalism did not have. It has to solve problems that bourgeois society did not ever consider. It is a mistake to analyze the first socialist countries with the categories elaborated studying bourgeois society. In order to face some limits and errors of the communist parties that directed the first socialist countries, some comrades propose the multipartitism and other similar “remedies” inspired by bourgeois democracy. According to us they are wrong. Only elaborating the categories of socialism, the experience of the first socialist countries becomes understandable and its study becomes reach of teachings. Communists elaborated a science of human history in general (the science of dialectical and historical materialism), and in particular a science of bourgeois society (criticism of political economy) and a science of class struggle that must be carried out for establishing socialism. Communist thought is not a new divine truth, revealed to men by some prophet, by a new Jesus Christ or by a new Mohamed. It is a science that men built and are building studying experience, trying again and again. Communists have also begun to elaborate a science of socialist society. Marxism-Leninism-Maoism includes also what of more advanced Communists elaborated as regards the experience of the first socialist countries. Anyway, much has still to be done. We are doing it, and we have to do it in the ambit of the renewal of the communist movement, that is founded on Marxism-Leninism-Maoism. The experience of the first socialist countries shows that the political structure of socialist societies is composed and must be composed by two contradictory elements. Examining the history of the first socialist countries, we see that so it was, even if the communist parties were not aware of it. Just because of it they acted blindly and underwent the laws according to which socialist society develops instead of using them. The outcome was that in the communist movement the left wing was not able to face the right. The modern revisionists prevailed. From this it followed the decadence and finally the collapse of the first socialist countries. Which are the two contradictory elements we can see in the political regimes of the first socialist countries? In every socialist country we see on one side a State in its historical sense: an organism professionally dedicated to coercion. On the other side it is a combination of mass organizations of many kinds They are the organizations of youth, women, national minorities and of other social sectors targets of particular oppression, victims of double or triple oppression. They are the professional and trade unionist organizations each one of them deal with an its own aspect of social life, the company and territorial councils, etc. At their head the communist party animates the entire system and is expression of this system. The communist party has the direction of the State as well. If the party has a right line, this guarantees that the state exercises a coercive function in the necessary direction (against the reactionary classes, the asocial elements, the aggression from outside) and as much it is indispensable. In the socialist countries the administrative coercion (the political coercion, exercised by the State) has to face also to the tasks that in the bourgeois society are accomplished by economical coercion: in the bourgeois society the proletarian that does not work as the master wants, does not eat, has not a home, has nothing of what is necessary for surviving. The progress of socialist society in the political field (and therefore, finally, in every field, considering the determinant role that politics has in the development of socialist society), consists of the development in extension of the ground of the social life ruled by the second element and in the restriction of the ground of the social life ruled by the first one (by the State). In every socialist country the Communists have to deal with the unity and struggle of this two elements of the political system in a conscious way, founding themselves on the tasks of the socialist society, on its internal state and the international context, on the concrete analysis of the concrete situation. Before the experience of the first socialist countries, the communist parties were not aware of this task, of this aspect of their task. That is why they failed. We, instead, can bear in mind their experience and advance. Our Party drew the conclusion that the experience of the first socialist countries becomes understandable and rich of teachings if we consider it on this theory, in the different phases that every socialist country passed through (the phase of the development of germs of communism, the phase of decadence, suppression and repression of germs of communism, the phase of introduction of capitalism by all means). Considering the experience of the first socialist countries on this theory, we draw many indications about how we can face better the political problems connected with the tasks the new socialist countries will have to face: the socialist countries that will be founded on the second wave of proletarian revolution advancing all over the world, in the ambit of the developing revolutionary situation created by the second general crisis of capitalism that just in the last year entered its final phase. We exhort all communist parties, all communist organizations, all true communists to study the experience of the first socialist countries with the specific categories of socialism. Socialism is a phase of human history higher than the bourgeois society: it is not possible to understand it with the specific categories of the lower phase. We Communists will draw great teachings from this elaboration and from the collective confrontation of the results of this elaboration in the ambit of the international communist movement. They will allow us to struggle with more determination and success for establishing new socialist countries. They will allow us to carry out the transition from capitalism to communism in the ambit of the new socialist countries with success and without the setbacks the first socialist countries suffered. This is also what we wish ourselves, all the communist parties and all the true communists. 1. 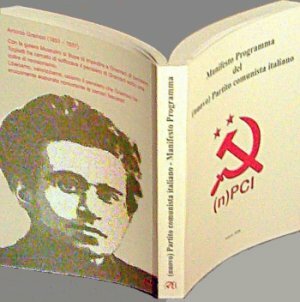 Nicola P., The Eighth Discriminating Factor, (new)Italian Communist party (http://www.nuovopci.it, EiLE, English section). 2. Marco Martinengo, I primi paesi socialisti, Edizioni Rapporti Sociali, 2003 (via Tanaro,7 20128 Milano(Italy) - e.mail resistenza@carc.it - www.carc.it). See also French and Spanish translation in http://www.nuovopci.it, EiLE, French and Spanish sections.